In tandem with the Environmental Protection Agency’s (EPA) proposed rule to reduce carbon dioxide (CO2) emissions from existing power plants, EPA also released a proposal to set federal performance standards for modified and reconstructed power plants (referred to in this Alert as the “Modified Source Proposal”). The Modified Source Proposal, which also was made public on Monday, June 2, would apply to existing power plants that are modified or reconstructed (as those terms are defined in the Clean Air Act and EPA’s regulations) after the date on which the proposal is published in the Federal Register. The Modified Source Proposal would require modified and reconstructed coal, oil, and natural gas fueled electric generating units (EGUs) to meet CO2 performance standards based on an array of efficiency improvement measures. This approach is a stark contrast to the proposed CO2 performance standards for new coal‑fired power plants, which are based on emission levels that are achievable only through retrofitting with carbon capture and sequestration (CCS) equipment. The rule also proposes that existing EGUs that are modified or reconstructed after becoming subject to state or federal standards of performance for existing power plants would be required to continue to meet the existing source requirements. In addition to proposing emission limits for modified and reconstructed sources, the Modified Source Proposal also proposes a number of adjustments to the applicability provisions of EPA’s recently proposed (and not-yet-finalized) CO2 New Source Performance Standards (NSPS) for new EGUs. All three proposed greenhouse gas rules were issued under section 111 of the Clean Air Act. For more information on section 111, see the Alerts and Updates tab of Van Ness Feldman’s Air Regulatory Practice website. EPA proposes to align the definition of a regulated EGU under the Modified Source Proposal with the definition the agency proposed in its January 8, 2014 proposed NSPS for new units. Thus, the sources covered by the Modified Source Proposal include both fossil-fueled boilers and Integrated Gasification Combined Cycle (IGCC) units, as well as natural gas-fired turbines. As with the NSPS for new units, the Modified Source Proposal would only apply to EGUs that are constructed for the purpose of supplying more than one-third of their potential output to the grid and which are designed to sell more than 219,000 megawatt-hours (MWh) in a year. Thus, as with the new unit rule, EPA’s Modified Source Proposal would not apply to any simple cycle turbines that are designed to operate as “peaking” units, with a typical capacity factor of less than one-third. However, as explained below, EPA is also proposing in the Modified Source Proposal to change the applicability requirements for gas turbines in several important ways. The Modified Source Rule would only apply to covered EGUs that undertake a modification or reconstruction. With certain exceptions, EPA defines a “modification” to mean “a physical or operational change that increases the source’s maximum achievable hourly rate of emissions.” One important exception is the so-called pollution control project (PCP) exception. Under the PCP exception, modifications undertaken for the primary purpose of installing pollution control technology do not subject the source to EPA’s modified source rules. EPA defines a “reconstruction” as “the replacement of components of an existing facility to such an extent that (1) the fixed capital cost of the new components exceeds 50 percent of the fixed capital cost that would be required to construct a comparable entirely new facility, and (2) it is technologically and economically feasible to meet the applicable [performance] standards.” However, EPA’s Modified Source Proposal requests comment on how the agency should distinguish between a reconstruction and a “new” construction. The distinction is important because EPA is proposing to apply a much more stringent standard to new fossil-fueled boilers and IGCCs than it would apply to reconstructed sources in the same category. EPA is proposing to treat a new unit built on property that is contiguous with an existing source as a “new” source. The agency is also seeking comment on whether the definition of “reconstruction” should incorporate an upper capital cost threshold (e.g., 75 % of the costs of a new facility). EPA proposes to set separate rate-based standards based on the technology and fuel of the covered EGU. The agency is also proposing separate standards for modified and reconstructed units. For fossil-fueled boilers and IGCCs, EPA is proposing that reconstructed units would have to meet a 12-month rolling average emission rate of 1,900-2,100 lbs. CO2/MWh, depending on the size of the unit. 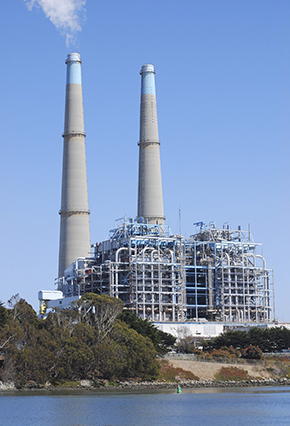 EPA is co-proposing two options for modified fossil-fueled boilers and IGCCs. The first co-proposal would require fossil-fueled EGUs and IGCCs to achieve a unit-specific emission limit that would represent a slight improvement over the unit’s best historical emissions performance. Under the second co-proposal, boilers and IGCC units that modify before becoming subject to a section 111(d) implementation plan would be required to meet the same emission limit they would have to meet under the first co-proposal. However, under the second co-proposal, units that modify after becoming subject to a state or federal section 111(d) implementation plan would be required to meet an emission limit selected by the entity administering the plan. This unit-specific limit would be based on the results of an “energy efficiency improvement audit” of the facility. For natural gas turbines, meanwhile, EPA is proposing to require both modified and reconstructed turbines to meet the same emission limits the agency has proposed for new natural gas turbines: 1,000 lbs. CO2/MWh-gross for turbines with more than 850 MMBtu/hour heat input, and 1,100 lbs. CO2/MWh-gross for turbines with 850 MMBtu/hour or less heat input. As our June 2 alert on EPA’s recently proposed CO2 emission guidelines for existing EGUs explains, EPA has proposed to require states to develop and submit state implementation plans that place limits on the emissions of existing EGUs within the state. In certain instances, EPA may also issue a federal implementation plan in lieu of a state plan. In the Modified Source Proposal, EPA has proposed to interpret section 111 to require modified and reconstructed sources that are subject to a state or federal implementation plan under section 111(d) to continue meeting the plan requirements, in addition to the federal performance standards for modified or reconstructed EGUs. According to EPA, this interpretation is necessary to prevent EGUs from undertaking modification or reconstruction in order to escape the requirements of their state or federal section 111(d) plan. EPA has proposed several changes to the applicability criteria that the agency will use to determine whether a source is subject to regulation. Some of these changes would affect only modified and reconstructed sources, while others would change the applicability criteria for both new and modified EGUs. Changes to Applicability Criteria for Modified Units. Under EPA’s proposed NSPS for new EGUs, an EGU is required to comply with the rule if it is designed to operate with a capacity factor greater than 33 % and sell 219,000 MWh or more to the grid on an annual basis. In addition, as proposed, new units must actually operate at those output levels in order to be subject to the new unit NSPS. For modified units, EPA is proposing to delete the “actual operation” requirement, which would mean that modified and reconstructed EGUs that are designed to operate at higher capacity levels but which actually operate at lower capacity levels or produce less power in a given period would remain subject to the same modified source emission limits (as well as any applicable existing source standards). According to EPA, units that are designed as baseload or intermediate units but that operate at relatively low capacity factors (e.g., below 33 %) can meet the relatively less stringent modified/reconstructed unit performance standards. Possible Changes to the New Source Rule. EPA is also taking comment on whether it should change some aspects of the applicability criteria that it proposed in the January 2014 NSPS for new units. These changes would apply to both new and modified/reconstructed units. EPA’s proposed applicability criteria for new units currently have the effect of excluding many simple cycle turbines—which typically operate as peaking units with low capacity factors—from regulation under the agency’s GHG new source performance standards. EPA appears to be reconsidering aspects of these applicability rules. For example, EPA is taking comment on whether it should establish a separate emission limit for low-capacity factor (peaking) gas turbines or establish an annual tonnage cap for smaller, less efficient gas units. Moreover, EPA is taking comment on other changes to its new and modified source standards for gas turbines, including whether EPA should establish a new, less stringent performance standard for gas turbines that would apply only during times when these units operate on a load-following (as opposed to baseload) basis. Comments on the Modified Source Proposal will be due 120 days after publication in the Federal Register. Van Ness Feldman closely monitors federal and state developments on climate change, air quality, and energy policy, and is in a strong position to provide expert analysis and advice on emerging legislation and regulatory activity, the surrounding policy and political debate, and the implications for your organization. For more information on EPA’s new proposed GHG standards, please contact Britt Fleming, Kyle Danish, Stephen Fotis, Doug Smith or any member of the firm’s Environment, Air or Climate Change practices at (202) 298-1800. Those interested in on-going coverage of climate change policy developments may wish to subscribe to Van Ness Feldman’s Climate, Energy, & Air Update here.